In August a family friend got a pistol for her birthday. 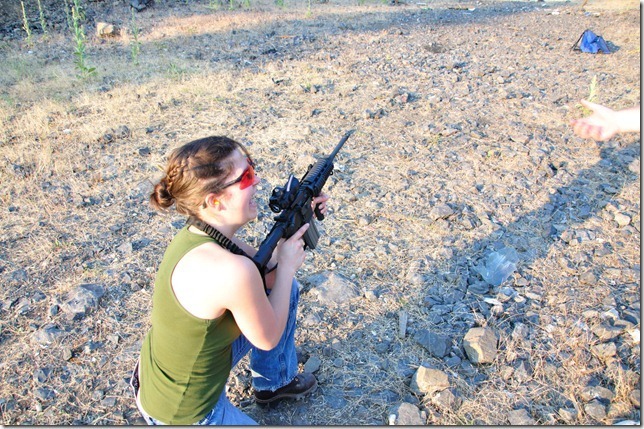 The only thing was though she had never learned to shoot. 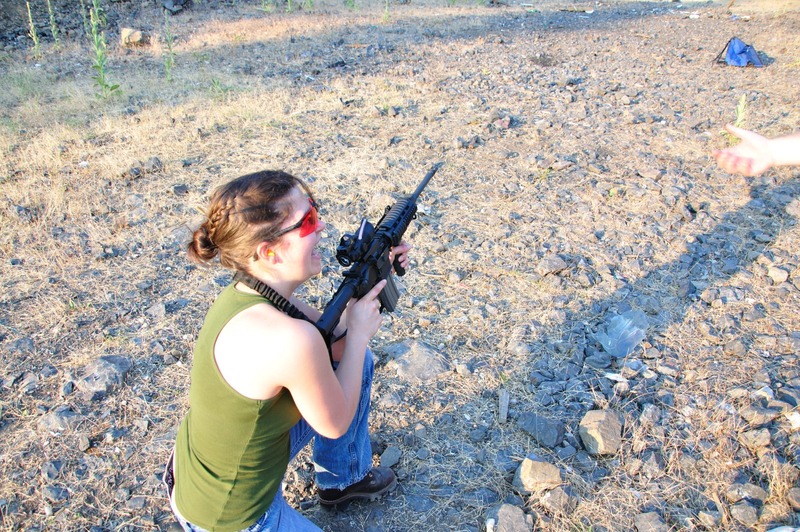 Her father is by no means opposed to firearms, however her mother hates them with a passion. I immediately got back to her, she was extremely busy with work for the next couple weekends but she could make it out to my place for dinner one night. She came over brought her new pistol. Went over the four rules, dos and don’ts, as well how to operate her particular weapon as well as a slew of others. She finally had a day off so we could take her out. I prefer to avoid ranges I’m unfamiliar with when I have a new shooter. I don’t like having to pay attention to other people around me possibly being unsafe while also watching a new shooter. After talking to Laurel, Corina, and Dan I found a place that would work really well. Only trick would be finding it, I knew approximately where it was. Rolled in as the sun was getting lower in the sky, perfect photography lighting, nice and warm. We started her off with the 22 single action revolver. After a few shots and she was getting comfortable since she had never shot before, and hadn’t ever handled a weapon except at my house a week earlier I wanted to make sure it was enjoyable as opposed to painful. After the 22 Revolver I pulled out the High Standard. It has more mass and is semi automatic. I spent some more time going over it’s operation again, how to load and release the magazine. How to verify the weapon is clear, as well as how to unload it. 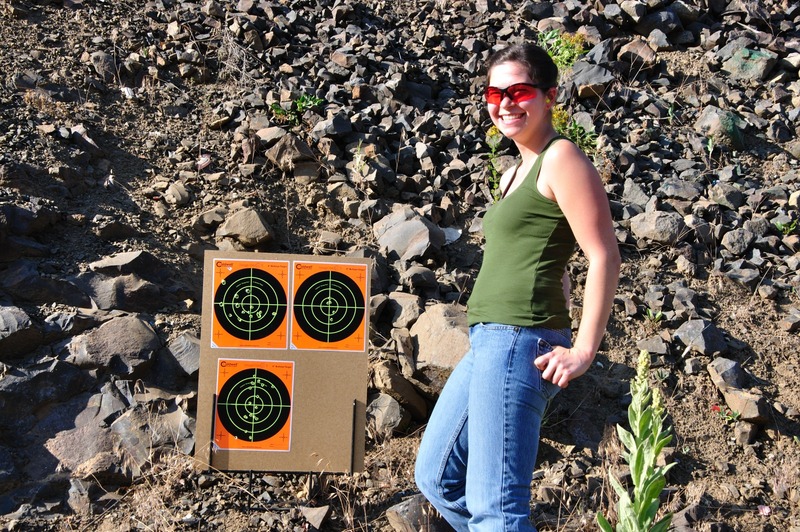 She did quite well for her first time shooting. 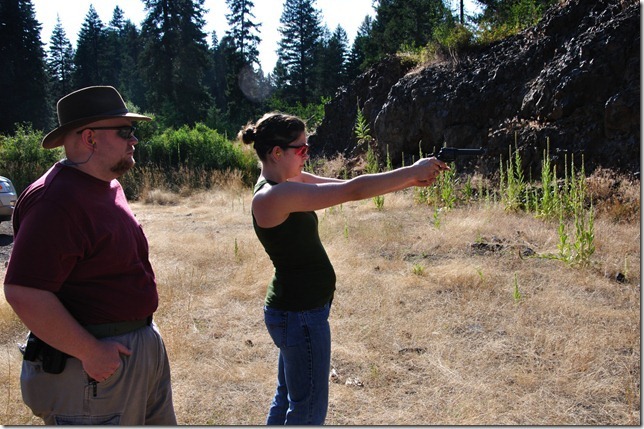 After this I fired some rounds out of her new pistol. The question of the day is since it’s a small 9mm, very light, how would the recoil feel. For me it was manageable, however thanks to it be double action only the trigger pull is extremely heavy and makes it uncomfortable. We put about about 50 rounds through it, we discovered it was causing her to flinch, we spent time working on that as well as spent some time on her stance. I’ve noticed a lot of new shooters have a tendency to lean back. 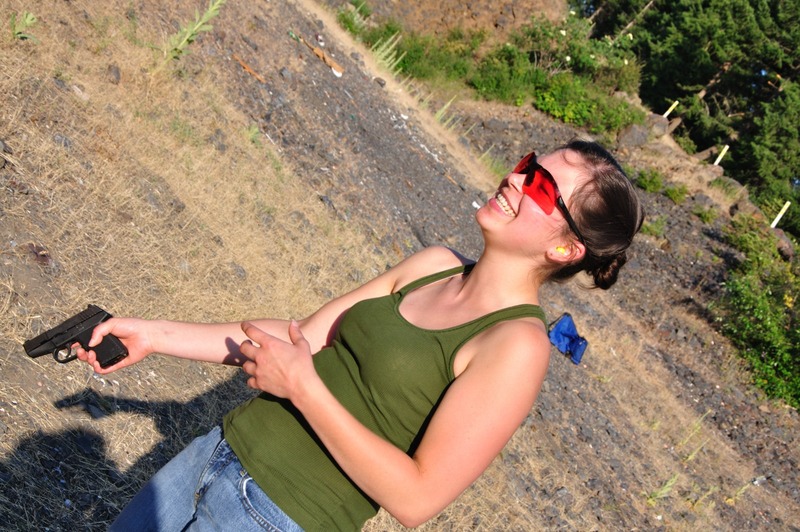 Even though that little thing packs a punch for the shooter, she absolutely enjoyed it and had a total blast. 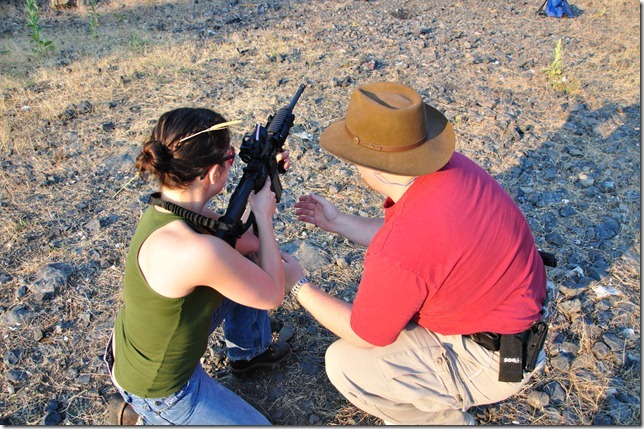 After we finished up with the pistol we pulled out my AR and went through some rifle fundamentals. 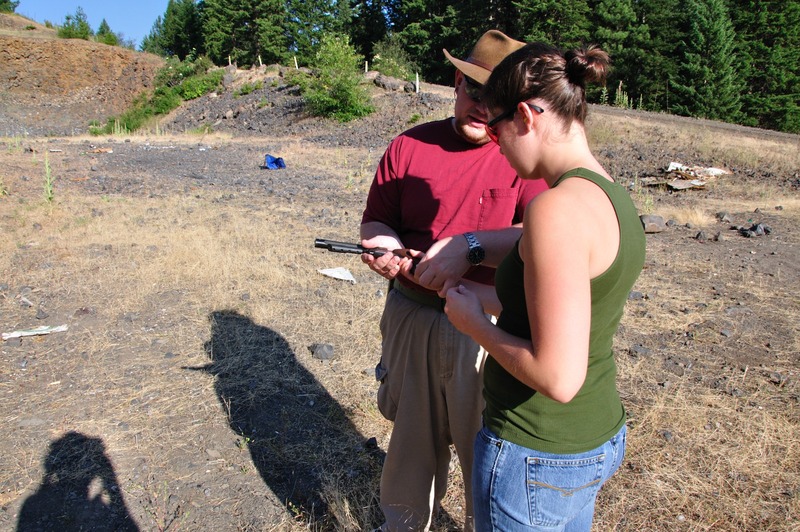 I normally start with the rifle to teach with then move to pistol but I made an exception in this case. I spent some time covering basics of position and breathing. After which she ripped up the hillside 100 yards away. Accurately I might add. Normally I would have run down and put up targets but we were chasing daylight and we had to get back out of BFE. 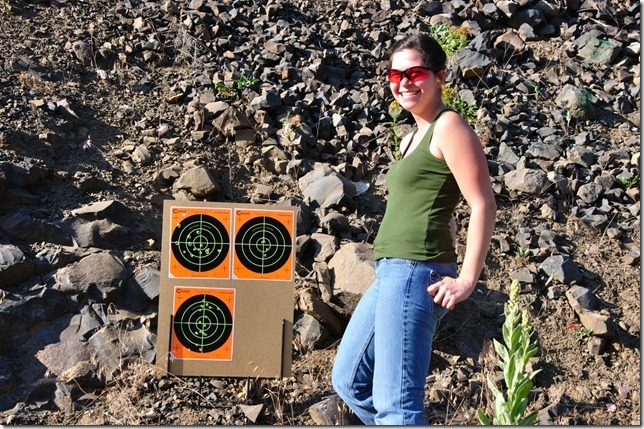 Someone had left some targets up and she just shot those. I must say though, the above picture says it all. A big smile, obviously having fun, and enjoying herself. I yet again must ask the question, WTF does VPC or the Brady Campaign have to offer?